As a Boston-based blogger, Newbury Street is top of my list for everything from shopping to dining! In fact, when I first moved here from California one of the things I loved most was all of the brick buildings and brownstones that lined this street. After all, we can’t have these in San Francisco due to the earthquakes! I just love the feel of the modern stores and dining establishments nestled among (and often inside!) buildings which are hundreds of years old. In fact, when my dad came to visit in January, Newbury Street was one of the first places I took him. Strolling down Newbury Street is a must for everyone from locals to tourists, and Joe’s American Grill is a neighborhood staple of over 30 years. Like so much of Boston, Joe’s prides itself on American classics. I’m super impressed by the fact that every one of it’s dishes is made by scratch in house, and can be tailored to any dietary restriction. I was gluten-free for over a year, so I can appreciate the fact that they can cater to gluten-free or vegetarian diets. 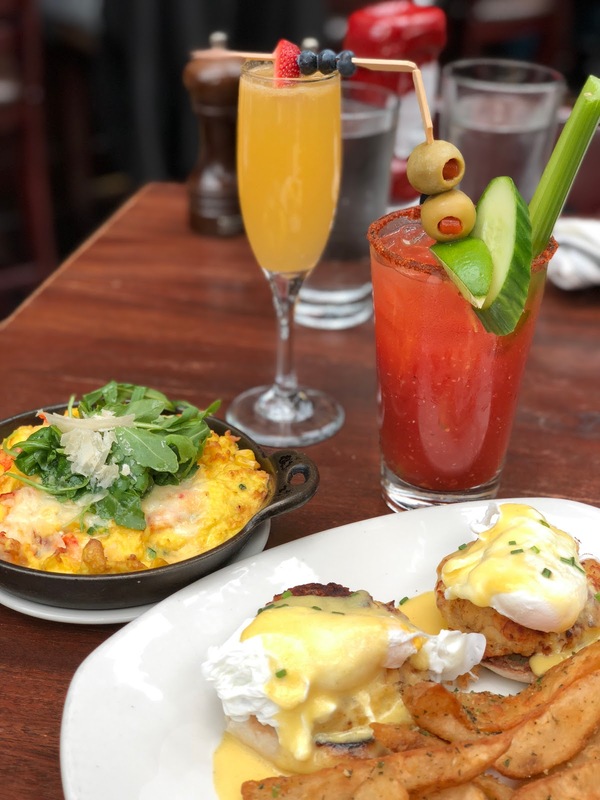 For a Saturday brunch, we got a refreshing mimosa and bloody Mary to go with the lobster frittata and crab cake benedict. Everything was seriously delicious and we were actually OBSESSED with the potato wedges! They were seasoned perfectly and the garlic reminded me of being at a ballgame in the best way! From the friendly service, to the scrumptious dishes and neighborhood feel, I definitely recommend Joe’s American Grill on Newbury Street to refuel while shopping! Plus, they even have live music and tall windows which they open up on warm summer days. You can’t go wrong! What’s your favorite brunch spot while shopping?